1. The Military Medal of Honour, was founded by the Elector Max-Joseph IV. (22nd November, 1794) in gold and in silver, to reward sub-officers and soldiers for brave conduct in war. With the silver medal the pay is increased one half, and with the golden it is doubled. It does not, however, increase with promotion, while, on the contrary, it diminishes with pension, and ceases altogether with discharge. The medal (No. 33, obverse; and No. 34, reverse) is worn on the left breast, suspended by a black ribbon with white and bright blue borders. 2. 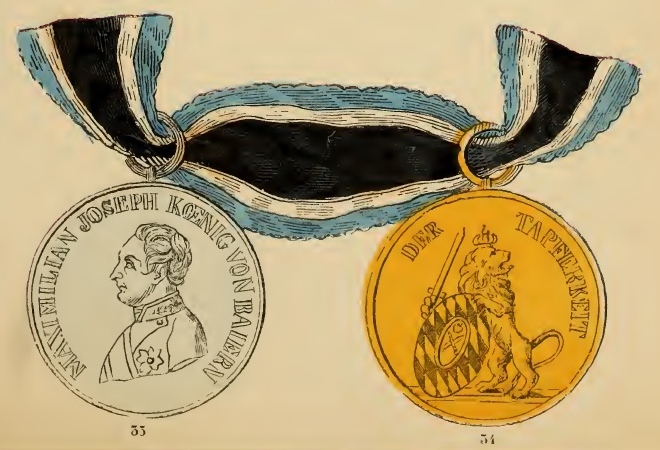 Decoration of Honour and Distinction for Military Surgeons - was founded by a military decree (8th November, 1812) by King Max-Joseph ; it is in gold and silver, the former weighing ten ducats and measuring one five-eighths Bavarian inches in diameter. It is worn on the left breast on the same ribbon as the previous, (No. 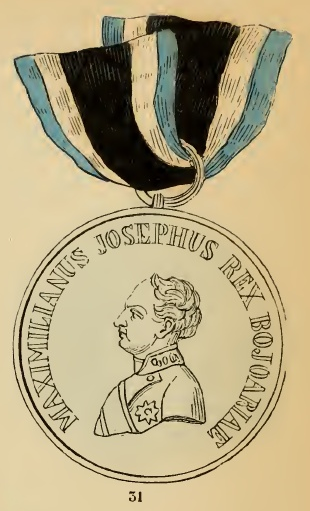 31), and represents on the obverse the effigy of the founder, with the inscription : "Maximilianus Josephus Rex Bejoarise" (Max-Joseph, King of Bavaria), and on the reverse : "Ob Milites inter Prselia et Arte et Virtute servatos" (for saving soldiers in war by art as well as by courage). The Patent says : "To claim this important reward, it is absolutely necessary that the candidate surgeons must have given their professional aid upon the field of battle or in the hospitals, without shrinking from the dangers around them, and have performed their duties with skill, presence of mind, and sympathy with the suffering wounded, &c., &c". The gold medal is presented (by the King in person) to established surgeons of regiments ; and the silver to surgeons of batallions and to mere practitioners. To the medal is attached a pension of 300, 200, 150, and 100 fl. (£30, £20, £15, and £10), the first two, to four owners of the golden medal, the third to eight, and the fourth to all the other possessors of the silver medal. 3. 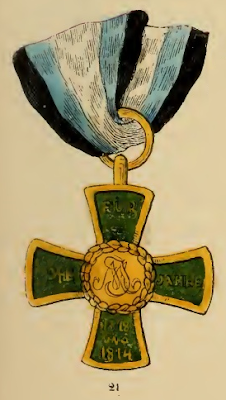 The Military Cross for the Years 1813 and 1814. (No. 21). It is a Cross cast from the metal of guns, and founded on the 4th December, 1814, in commemoration of the War of Liberty of that period. It was distributed 27th May, 1817, not only amongst the troops who had actually made the campaigns of the two years ; but also amongst those who had entered the service as late as the following year (1815). It is worn on the left breast, the Bavarian Field-Marshal, Prince Wrede, was, however, allowed to wear it round the neck. It is also suspended on the standards of the regiments who served at that period.